RICHARD G. OSTRANDER of Yonkers, N. Y. is not a man who puts things off till tomorrow! Recently his young son narrowly escaped injury when he was thrown off an automobile seat by a sudden stop. To Ostrander this was a situation when stop meant go. 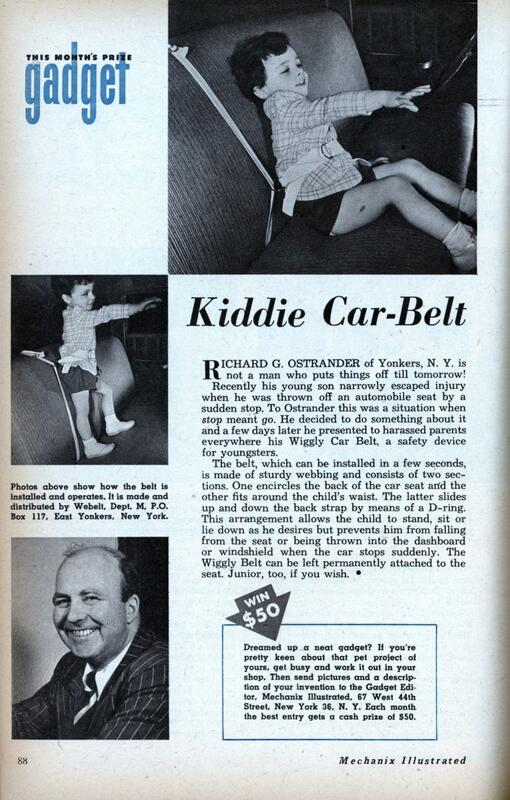 He decided to do something about it and a few days later he presented to harassed parents everywhere his Wiggly Car Belt, a safety device for youngsters. The belt, which can be installed in a few seconds, is made of sturdy webbing and consists of two sections. One encircles the back of the car seat and the other fits around the child’s waist. The latter slides up and down the back strap by means of a D-ring. This arrangement allows the child to stand, sit or lie down as he desires but prevents him from falling from the seat or being thrown into the dashboard or windshield when the car stops suddenly. The Wiggly Belt can be left permanently attached to the seat. Junior, too, if you wish. My folks used to keep me in the back seat of our Rambler and not flying towards the windshield because of one of these things! My dad installed this, or something just like it, for my twin sisters in the very early 60’s. At the same time he also retrofitted lap belts in our late 50’s station wagon years before belts were required in autos. Today I use a harness and the existing shoulder belt to keep my dog strapped into the seat. Like the harness in the above article, it allows him to lay on the seat or sit up and watch the world go by. I have a picture of my youngest son sitting in a flimsy car seat that hooked over the seat of our ’69 falcon wagon. It gives me the creeps now, but that’s what was normal then. My granddaughter gets strapped in like an F-15 pilot. Yeah, over the holidays I visited my folks, who have a framed photo of my brother in a hook-over-the-car-seat, tubular metal “baby car seat” circa 1960. 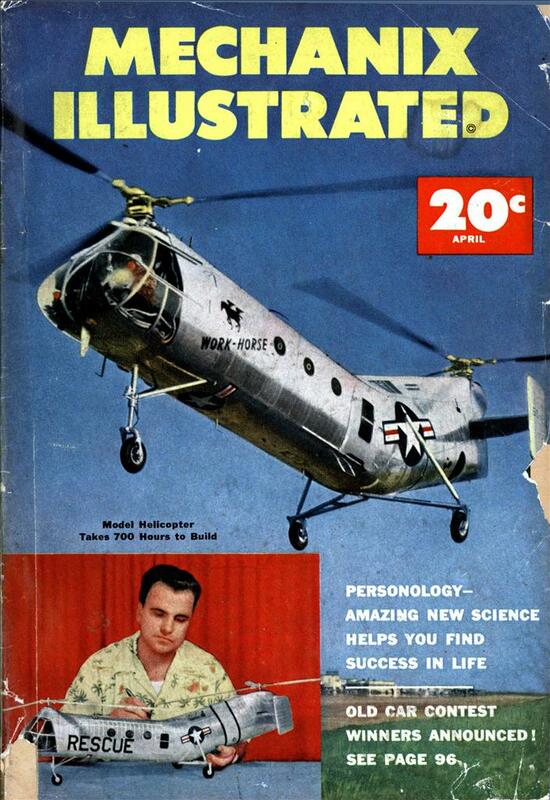 I pointed it out to my son and said, “Hey, there’s Uncle Zack in his Baby Slicer 2000.” We both got a laugh. When we were kids we wanted to be in the way back of the station wagon, and dad would let me sit in his lap and “let me drive” when I was young. Now, I think they send you to re-education camp for that. I grew up on a farm and started driving the truck in the fields when I was 5 or 6. I would drive along while my Dad threw grain, hay, manure, etc out of the back. Certainly couldn’t have buckled in or I couldn’t have reached the steering wheel. It sure would be great to make the people who think children have to be wraped in cotton come out to a family farm for a weekend. Their popping heads would make great fertilizer. a baby. The father was driving, the mother was holding the baby in her arms instead of a car seat. The adults were unharmed. The baby was killed. Automobiles are the number one cause of death for children under 16. Just google “child killed in automobile accident” and you would be suprised how many unrestrained or improperly restrained children die each day.